ProJo takes a look at Brown’s scaled back development plans for Providence. Let’s take a closer look at the actual projects. Officially known as the Perry and Marty Granoff Center for the Creative Arts, the arts center is being built between the Brown Office Building and the Brown Walk on Angell Street up on College Hill. The $40 million arts center is designed by Diller + Scofidio, the same architects that designed the new Institute of Contemporary Arts in Boston. According to Brown the center will include a recital hall, recording studio, multi-media lab and studios. The 3-story builing is in-progress now with an expected completion late next year. The Aquatics and Fitness Center is also being built up on College Hill on the grounds of the Erickson Athletic Complex. The $40 million project is a scaled back version of a larger 2-building proposal. The new Aquatics and Fitness Center will feature a 50 meter competition pool with a diving well. It will include 800 spectator seats. In addition to this state of the art pool, the center will have fitness areas, dance studios, locker rooms and administrative offices. A lobby featuring a cafe and lounge space will serve the Brown community. Most of the parking fronting Hope Street currently will be replaced by a new quad. 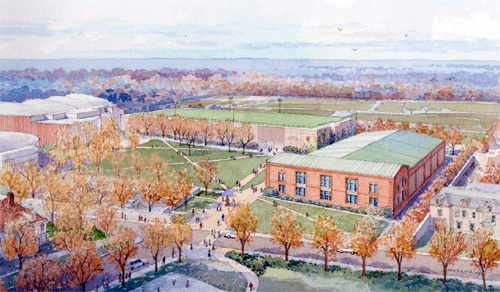 Construction is expected to commence this summer with a completion in late fall of 2011. Officially known as the Alpert Medical School, the $45 million renovation of the building at 222 Richmond Street in the Jewelry District represents a scaled down med school plan. The university had originally planned to construct a new building near Rhode Island Hospital. Renovation of 222 Richmond is set to begin this spring and be complete in the fall of 2011. 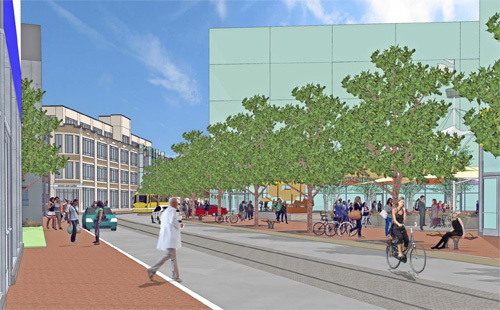 As part of their plans for the Jewelry District, Brown is proposing substantial streetscape improvements along Richmond and Ship Streets. 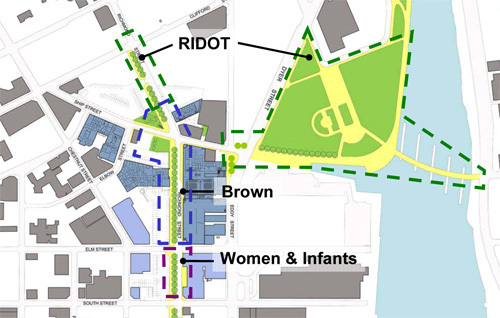 The plans include wider sidewalks with a tree canopy on Richmond between Clifford and Point Streets (in conjuction with RIDOT and Women & Infants Hospital), RIPTA’s proposed streetcar line, a walkway to the river along Ship Street, and a new public square at the intersection of Richmond and Ship Streets. The university also strongly backs a proposed footbridge across the Providence River around the area were old Route 195 currently stands. In order to make Richmond Street wide enough to accomodate increased sidewalk widths, trees, traffic, a streetcar line, and parking, it appears that Brown proposes lopping the front off of (or replacing) 233 Richmond Street, a dryvit clad building currently occupied by state offices. And removing the small, but somewhat charming, Bishop Building at (about) 270 Richmond Street. The loss of the Bishop Building wouldn’t be such a bitter pill if Brown weren’t envisioning surface parking to go in it’s place. In fact, in the proposal presented to the CPC, pretty much the entire west side of Richmond Street is surface parking. Makes the promenade suddenly less attractive. With the streetcar line proposed to run down Richmond Street, we can certainly hope that developers intent on building on the streetcar line will quickly scoop up these surface lots and build something on them. Brown has several other projects in the pipeline for their 2006-2011 capital plan representing $400 million in capital spending. See more at Building Brown. Not only is the entire greenway project between the main green and Pembroke campuses horribly conceived to begin with, but this new creative arts building is sited horribly as well. It’s unfortunate, because it has the potential to be an extremely cool building. When are they going to start paying taxes for all this development? Maybe the big three schools should start paying into the actual infrastructure of the city, so that everyone can have a decent life here in providence? 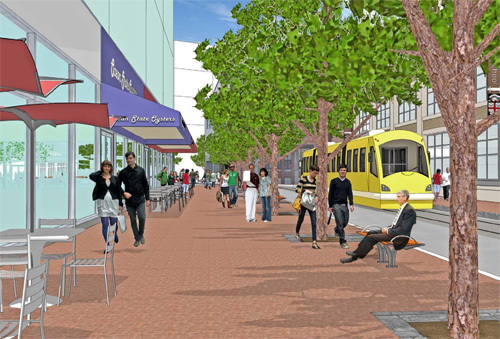 The Brown Daily Herald reports on some of the progress on projects in the Jewelry District. 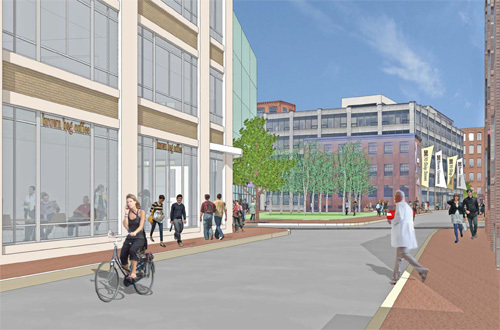 Notably, Med School completion in July, and Ship Street Square open space project getting underway in May.